The New York chapter of the American Society of Landscape Architects (ASLA) is celebrating its 100th anniversary this year at the 2014 President’s Dinner Gala. 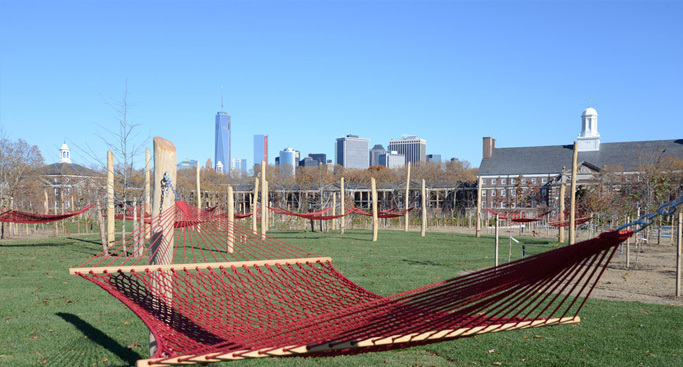 For this occasion, the ASLA has selected the Rockefeller Foundation’s Judith Rodin, the Trust for Governors Island’s Leslie Koch, and the NY1 News Organization as their honored guests. The New York chapter of the ASLA was established in 1914 as the second chapter of the national organization and has since become a leader in urban landscape design and architecture. The annual President’s Dinner celebrates the accomplishments and contributions of individuals and groups who have made a prominent and positive impact on the New York architectural community. This year’s event will take place on Thursday, November 6 in Tribeca. Judith Rodin, the first of the honorees this year, is the current president of the Rockefeller Foundation and an avid supporter of the Rebuild by Design initiative to increase the resiliency of the Eastern seaboard. As president of the Rockefeller Foundation, Rodin has given the Rebuild for Design competition a great deal of support; the Rockefeller Foundation is the biggest and most generous funding partner of the competition. The second honoree, Leslie Koch, is the president and CEO of the Trust for Governors Island and has been the recipient of numerous awards from various Architectural organizations, including the ASLA. Since taking charge of Governors Island in 2006, Koch has transformed the barren military base into a major public attraction. Finally, NY1 News has had an important role in bringing the news on architecture and urban landscape design to the eyes and ears of New Yorkers. Through their news coverage, NY1 News has provided residents of New York with a greater understanding of issues involving landscape architecture.